* What to do with a few days off work for as little money as possible? Why not go to another country? I found an absolute steal on P&O Ferries website for their mini cruise from Hull to Rotterdam and back – Â£80 for an interior cabin with bunk beds! I think this is probably a Winter rate and only on certain days, as the mini cruise booked just a day before or a day after would have been Â£130. We decided to “splurge” and upgraded ourselves to a cabin with a window for an extra tenner. Having the window wasn’t super important since it would be mostly dark out while we were in the cabin not to mention sleeping, but the extra Â£10 also gave us two twin beds instead of bunk beds so the room was slightly larger too. And it was only an extra tenner. 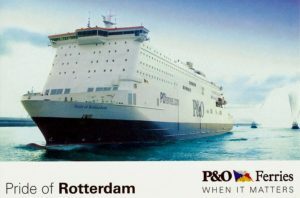 When you book on P&O’s website, you also get the option to add Breakfast & Dinner on both days at a slight discount, so we added Breakfast & Dinner on the day we would be in Rotterdam, bringing our total to Â£146. The price of the cruise also includes a bus transfer from the Europort to Rotterdam central, but it does not include transportation to or from Hull city centre. However, there is a shuttle bus operated by Stagecoach departing from stand 38 (I think) at 5PM and it costs Â£2.30 for a single. 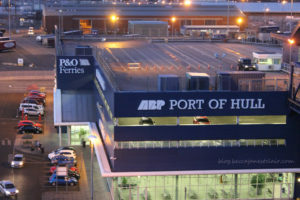 The shuttle then picks you up at the port of Hull at 830AM the day you arrive back and it’s a short 20 minute ride back to the railway station. However, I probably wouldn’t book a train until at least 0930 as you never know what kind of delays you will have! We also decided to arrive in Hull around 330PM, which gave us plenty of time to have a late lunch/early tea at the shopping centre next door to the railway station (and we didn’t buy food once on the boat unless a hot chocolate counts!). 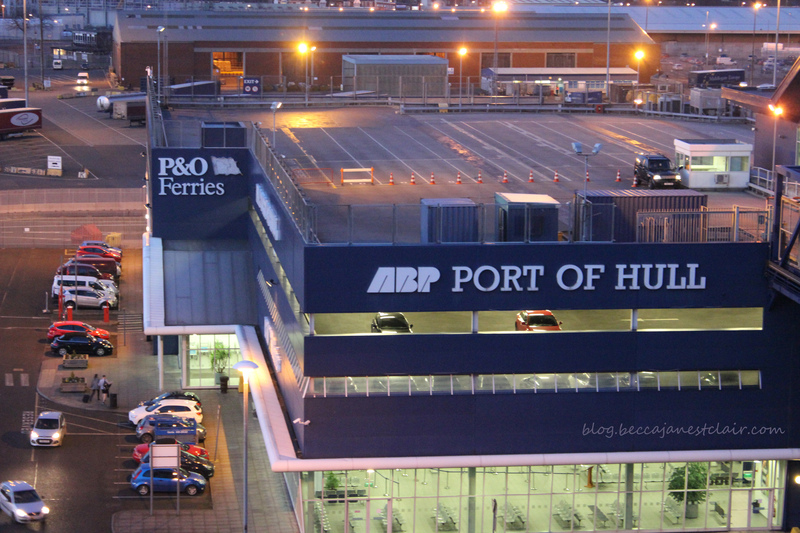 The Port of Hull is a very simple building/multi-story car park. You enter as foot passengers on the ground floor to check in, and then you immediately get directed through security (random bag checks happen) and passport control with no chance to use a loo or get anything to eat from a vending machine. 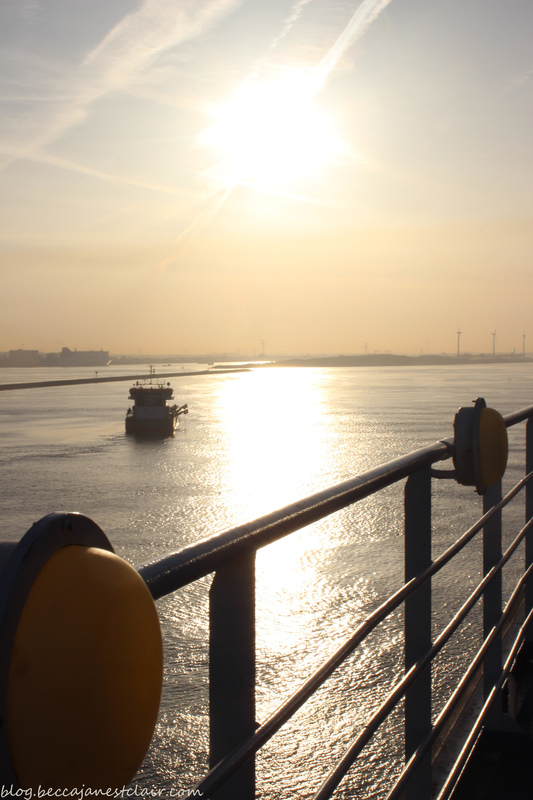 Then you go up….and up…..and up……before finally getting to the gangway to get onto the boat. As a foot passenger, you enter the boat on Deck 8. 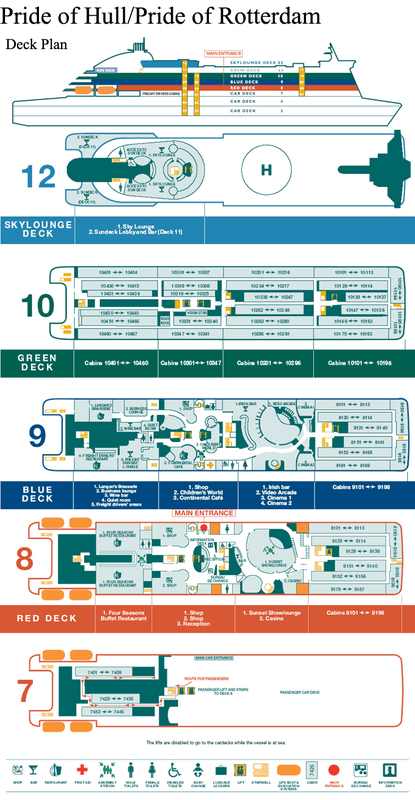 The bulk of the accommodations are on deck 10, with some cabins on 9&8. Lorry drivers get their own lounge and accommodation on deck 7. Apparently there is an option to not have a cabin, but when the sailing is 12 hours long and the cabin only cost Â£20, it seems silly not to. 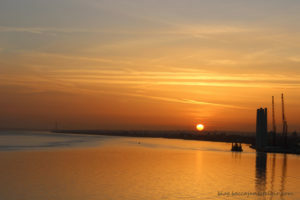 Even if you are bringing your car or caravan along, there is no unaccompanied access to the car decks, so you could not sleep in your car or caravan. 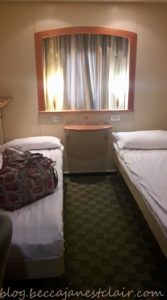 Once on board the ship, you have the option to immediately go to your cabin to drop off your bags. 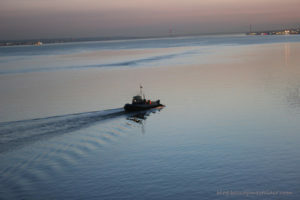 The restaurants are open, however the coffee shop does not serve hot snacks until after 8PM, and the casino and duty free shops aren’t open until we are out of the Humber. The ship also has an Irish bar, 2 cinemas (you pay extra for them), a child’s softplay area (free), a lounge for live shows (free), and an arcade. There is no room service like there would be on a large cruise ship, and the only option for takeaway food is the snack bar/Starbucks. I’m not sure if the Irish bar serves food, but the restaurant options are either a sit down brasserie or the buffet. The duty free shops aren’t very large. They have a tobacco and alcohol shop (we didn’t go in), a candy and other sundry items shop, and a perfume and makeup shop. We went into the candy shop thinking it would have snacks like a convenience store, but they didn’t and I wound up buying a bag of crisps from the Starbucks. Tim was talking to one man who told him he takes these cruises only to buy duty free cigarettes and it somehow is worth it for him. Neither Tim or I are smokers, so we have no idea how much they cost or if it really is a good deal. Once we dropped off our bags in our cabin, we immediately went out on deck. Unfortunately (as a non-smoker) the entire outside areas are smoking areas as is the slightly protected area on Deck 11. It’s annoying, but you just have to stay upwind from the smokers! But the views of the sunset were pretty amazing and made the smoke worth it! Of course, no trip would be complete without Hamish, so he tagged along too! 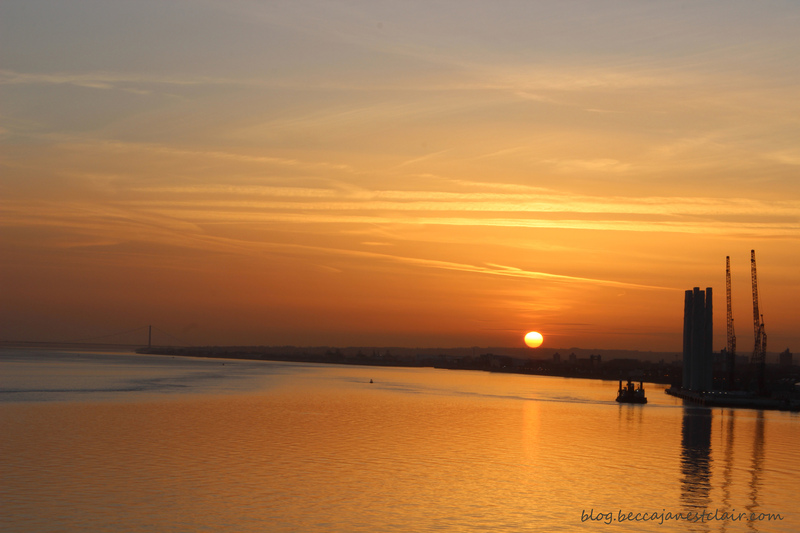 After taking our photos of the sunset, we headed back in and browsed the shops (we spent all of Â£13 on a guide book for Rotterdam, a Dutch phrase book, and some ginger chews), and got some hot chocolate and snacks to take back to our cabin. We retired early and watched an episode of Lewis I had downloaded to my Kindle, and set the alarm for dawn so we could hopefully catch the sunrise. 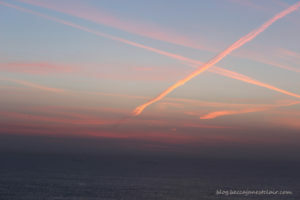 The sunrise wasn’t as spectacular as the sunset. Plus, we were running a little late as we had a problem with our cabin in the morning. This is my only complaint about P&O, but I did get an apology out of them via email, so I do forgive them. When I showered on Thursday morning (around 0600 CET), I made sure the bathroom door closed behind me when I took my shower, and after I was finished I turned off the water and waited in the bathroom until there was no more visible steam in the room before opening the door to swap places with my husband. While he was showering and I was towelling off there was a loud knock on the door. Now, as it was 6AM (5AM in the UK), I assumed it was silly drunks banging on doors, so I ignored the first knock. When there was a second knock, I asked “who is it?” and the response back was “Ship Police”. Again, this sounded a bit suspicious as I had not contacted the police and I knew we had not done anything that would have required police. I asked “Do you have any ID?” and all I got back was “This is the ship police”. I repeated my request for ID, and the response now changed to “This is the Ship Police and I need to check something in your cabin”. Well, progress I suppose. I responded “There’s nothing wrong with my cabin”. Bearing in mind, I STILL DID NOT KNOW if he was actual ship police or someone trying to gain access to rob us. Then I got told to “open the door or I will”. Now, I was scared. A stranger was going to open the door to my cabin without my permission. So I called back that I was naked and my husband was in the shower, and we needed a minute to throw some clothes on. AT THIS POINT I HAD TO OPEN THE BATHROOM DOOR WHILST THE SHOWER WAS RUNNING to alert my husband to the police outside our door. This was the ONLY time the bathroom door was open during a shower. My husband came out with a towel around his waist, and I hastily threw on a dress. We had another knock and I told him if he had a key to let himself in (because if he was a stranger, I was sure this would then deter them to go away). He did, and as it turned out, the little light on our fire detector was on. He then accused us of leaving the bathroom door open while we showered, told us he had to go tell the ship’s captain that nothing was wrong, and left. My husband then finished his shower but took a tepid shower as we were now afraid to take a hot shower. That night, after we had turned out the lights and my husband had gone to use the loo, I noticed there was a sizeable gap at the bottom of the bathroom door that the light was streaming through. I pointed this out to my husband, and the following morning when we showered, we shared one towel between us and used the other at the bottom of the door to block the gap and I took a tepid shower as I was now afraid to shower with hot water. So yeah. Make sure there is no gap in your bathroom door, and if there is, block it with a towel or you risk setting off the fire alarm and having a visit from the ship police! After getting dressed and getting our photos, we went to Breakfast. The Breakfast buffet was half continental style and half full English style, so there were plenty of options. The layout of the buffet was a little backwards to me though. You needed to pick up your bread at the beginning, but the meats and cheeses for a continental style breakfast were not until after the hot food. The tea and coffee were at the very end, but after we entered the buffet everyone headed straight for the tea/coffee and it created a bit of a bottleneck between people who were going through the queue and getting their drinks last and the people who wanted to get their drinks first. After breakfast, we hung out on the deck and watched the ship dock before being called for debarkment. If you drove you car, you have a massive rollercoaster style ramp to drive on to get to the shore, but for foot passengers, it was once again a long tunnel and lots of escalators (this time going down!) to get to passport control. And just like in Hull, you could not access the public loos or vending machines once you went through passport control. It was then on to the shuttle bus for our day out in Rotterdam. Oh, and I should mention that since we had booked it as a mini cruise and our boarding card had a little suitcase on it we were able to leave things in our cabin. If you did not have a suitcase symbol on your boarding card but were coming back that evening, you could make arrangements to store your luggage on the ship. There will be a separate post about our adventures in Rotterdam. At the end of the day, we took the shuttle back to the port and after boarding we decided to stash our camera bags in our cabin before going to dinner. At this point, we were both pretty tired and didn’t want to take photos out on deck. Dinner was really good! They had several hot options including 2 types of curry, salmon (although it was labelled as trout! ), chicken fingers, chips, steamed vegetables, salad, 2 types of cake, ice cream, and cheese & biscuits. We ate a leisurely dinner before once again retreating to our cabin for another episode of Lewis before falling asleep. In the morning, we opted to buy snacks in Rotterdam the day before so we skipped breakfast and instead were able to sleep in a bit later. Due to the shower situation, we both took slightly cooler showers, finished packing up, and were soon debarking back onto British soil. Another short shuttle bus ride, and we were back in Hull and after two trains and another bus, arrived home in our village with our kittens around noon, making our total time away just about 48 hours exactly! We will definitely be doing this again, and might even do the three day cruise with an overnight hotel stay in Rotterdam next time. 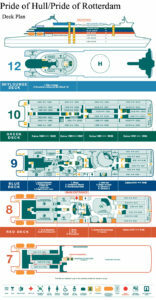 *Stock photo and deck plan images from P&O Ferries. I did not receive any compensation from P&O Ferries in writing this blog post.